Inspiration in artefacts...for artists Ewan Robertson (left) and Gordon Munro, who have worked with iron to create sculptures - both individually and collaboratively - for the last ten years. Falkirk’s long and proud history with the iron industry is currently being celebrated with two Falkirk Community Trust exhibitions in Callendar House. Fe Iron, The Falkirk Story in the second floor gallery focuses on the iron founding history of the area and its impact on the wider world. Expert introduction...to the exhibitions from Carron man Brian Watters, who wrote a book on the Carron Company in 2010. And Iron: Artefacts and Actions in the Park Gallery responds to and explores Falkirk Community Trust’s extensive archive of iron artefacts, patterns, photographs and written material relating to the many foundries and industry that thrived in the area. The exhibitions launched on February 10, aptly with Carron’s own Brian Watters providing the introduction. A former technical officer with BT, Brian is an expert in the Carron Works having written a book on the subject in 2010 – Carron: Where Iron Runs Like Water. He said: “I was asked to do an introductory talk, explaining how the Carron Works were founded, the products that were made and the skills learned there. Rake...is one of the new works being exhibited in Callendar House by artist Gordon Munro. “Falkirk was a market town with agriculture being the main economy. “But when Carron started in 1759, industry came to the town with a big bang! Artists and Edinburgh College of Art lecturers Gordon Munro and Ewan Robertson have created new works for Iron: Artefacts and Actions. Exhibitions officer Gillian Smith saw their work at Edinburgh Sculpture Workshop and approached them to take part in the Falkirk exhibition. The duo’s large scale collaboration installation Cloud Dialogue has been newly configured outside Callendar House. But both artists, who have worked with iron for the last ten years, have each created three new pieces too. Gordon’s works – Sleeker I, II and III and Rake – focus on items in a foundry, while Ewan’s sculptures – Seam, 100 Years of Plasticine and Occultations in Regulus – explore the beauty of iron and where it comes from. Gordon said: “We didn’t just want to shift our work from one place to another. “We saw it as a chance to create new work, focused on the foundries in Falkirk. “So we both looked through Falkirk Community Trust’s archives and selected objects to base our work on. “I was inspired by the tools used in the casting process and sculpted in response to that. Ewan’s artwork is arguably more ambiguous. He explained: “I was inspired by the purest origins of iron as a material. “Made from supernova explosions, it’s the most abundant metal on earth. Iron: Artefacts and Actions also includes a short film, Iron: Origins and Destinations, by filmmaker Rachel Nolan. The film looks at iron in the wider world including meteorites and magnetite, used by some insects, mammals and birds as a means of navigation, as well as looking at how iron is used in contemporary creative practice. Two special events have also been lined up in conjunction with the iron exhibitions, which will be on display until May 27. On April 6, there will be a Mobile Foundry Workshop in Callendar House and Park. And on May 19, there will be a film event at Bo’ness Hippodrome with Dr David Mitchell from Historic Environment Scotland, from 2.30pm to 4pm. 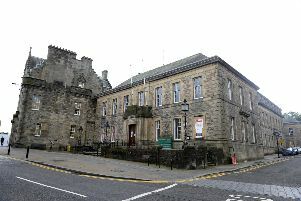 For more details, visit www.falkirkcommunitytrust.org. Brian Watters has loved the Carron Works since he was a boy growing up in their shadow. So who better to give us a brief history? The Carron Company was founded in 1759 by John Roebuck, Samuel Garbett and William Cadell. Initially built on 14 acres of the Stenhouse Estate, within two years it extended to 149 acres. Carron was the first in Scotland to use coke instead of charcoal in the production of pig iron and also pioneered the longwall system of mining. Initially, expertise was brought in from Coalbrookdale in England but the incomers taught locals so the workforce grew to 600 in just two years. In The Napoleonic Wars from 1803 to 1815, Carron Company was the second biggest supplier of guns to the Navy. But it cast a vast range of products. From pots and pans to munitions and from steam engines to baths, cookers and sinks, products from Carron reached out over the globe. Stoves went to the Hudson’s Bay Company, pig iron to Pakistan and haulage gear to mines in India and Africa. Even today, Carron is far-reaching. Brian said: “I’ve lost track of the number of people who send me holiday snaps with pictures of Carron products. Former Carron man George Sherriff began his Dalderse Foundry in 1804. It didn’t last long but many of his employees went on to work at the Falkirk Foundry in 1815. Camelon Iron Company opened in 1845, followed by Bonnybridge based Ure and Co in 1860, the Gowanbank Works in 1864 and Grahamston Iron Company in 1868. Globally, Carron remained the most famous name though. Sadly, the foundry closed in 1982 but its story will live on in its products forever.